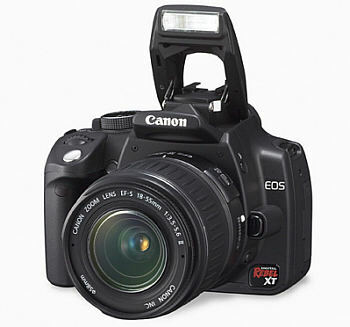 I have had my Canon EOS 350D for some years now, and have finally decided to upgrade my standard “kit” lens – the 18-55 mm cheap, plastic one that many wouldn’t want if you gave it to them. It has given me many good photo’s, but I must admit to looking longingly at those exquisite photo’s in the glossy travel mags, and wish that mine could look a little more professional, and a little less entry-level. To put this into perspective – photography is a hobby. I try to take photo’s that are interesting, unusual and “correct” – if there is such a thing. But I get no remuneration for my hobby (I can’t call it my work if I don’t get paid for it) – and from this point of view spending almost ZAR 12,000 (which in South Africa can get you a small, second-hand car) is difficult to justify, if not downright unaffordable. I first started considering the 17-85 mm (because it is the cheapest “proper” lens). I am not yet considering Sigma and Tamron options, because I would dearly like to have a Canon lens, especially if I am paying a significant amount on it. I would be prepared to pay the ZAR 6,200 for the 17-85 mm, but would really like to hear from fellow photographers if it would be worth my while spending this money to replace an 18-55 mm with a 17-85 mm lens – in other words since I am not gaining anything in lens length, I would need to see the results in quality of picture alone – would I get that with the 17-85 mm? Although a lot of people love this lens, almost as many don’t. Many would suggest spending the extra money to get the 17-40 mm, but I need to find justification in spending an additional ZAR 3,000. This is an “L” lens, so has extremely top quality glass, but then again doesn’t have Image Stabilization. The 17-55 mm is admittedly the cream of (this) crop – fast, with IS, USM and incredibly clear pictures – few would dispute this. But it is perhaps too expensive for me. Would someone like me – an amateur photographer – be happy with and enjoy the 17-85 mm? It would be my walkabout lens, i.e. the lens that I would leave on the camera, and use it for kids birthday parties, the occasional sunsets and as often as possible – wide-angle landscapes? I have also dabbled with portraits, and so would use this lens for that as well. Any comments would really be appreciated. 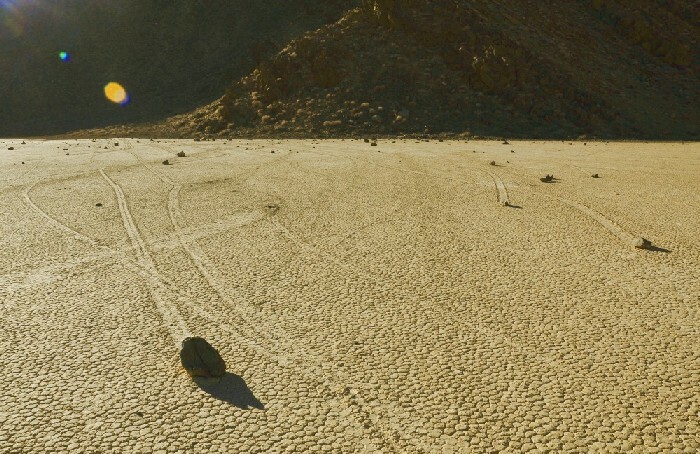 Deep in the heart of the California desert lies one of the natural world’s most puzzling mysteries: the moving rocks of Racetrack Playa, Death Valley. These are not ordinary moving rocks that tumble down mountainsides in avalanches, are carried along riverbeds by flowing water, or are tossed aside by animals. 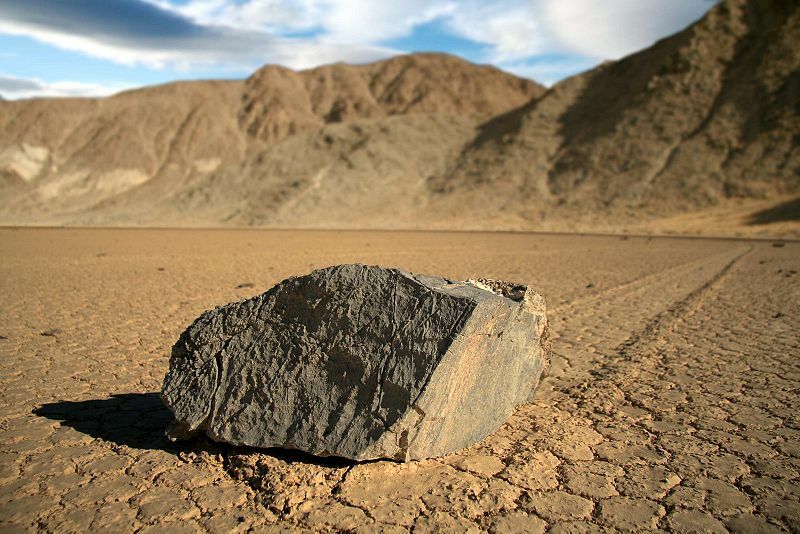 These rocks, some as heavy as 700 pounds, are inexplicably transported across a virtually flat desert plain, leaving erratic trails in the hard mud behind them, some hundreds of yards long. They move by some mysterious force, and in the nine decades since we have known about them, no one has ever seen them move. The floor of the playa is dried, scorched mud which has broken into perfect little octagons and pentagons and mosaic. This is as “desert” as you can get in America. It’s as flat as flat can be. With rocks which seem to move on their own. They break off the hills you see in the background. Their tracks vary in length, going every which way from zig-zags to loops; some double back on themselves. Some travel only a few feet; others go for hundreds of yards, yet they can be right next to each other, and right next to some that don’t move at all. 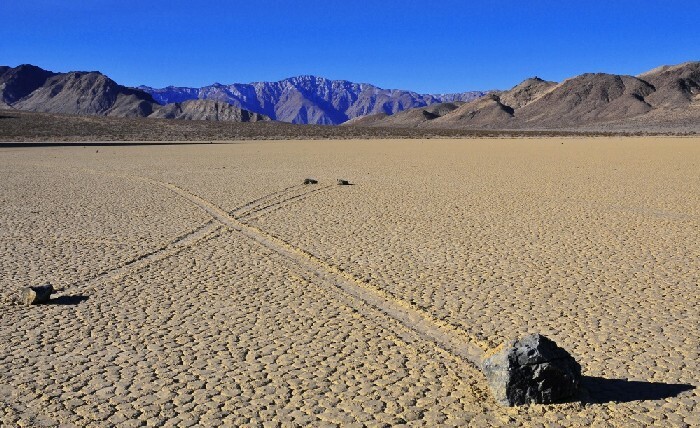 These sailing stones, also referred to as sliding rocks or moving rocks, are assumed to slowly move across the surface of the playa, inferred from the long tracks behind them, without human or animal intervention. They have neither been seen nor filmed in motion and are not unique to The Racetrack. Similar rock travel patterns have been recorded in several other playas in the region but the number and length of travel grooves on The Racetrack are notable. Racetrack stones only move once every two or three years and most tracks last for just three or four years. Stones with rough bottoms leave straight striated tracks while those with smooth bottoms wander. Stones sometimes turn over, exposing another edge to the ground and leaving a different-sized track in the stone’s wake. Strong sustained wind to keep stones going. 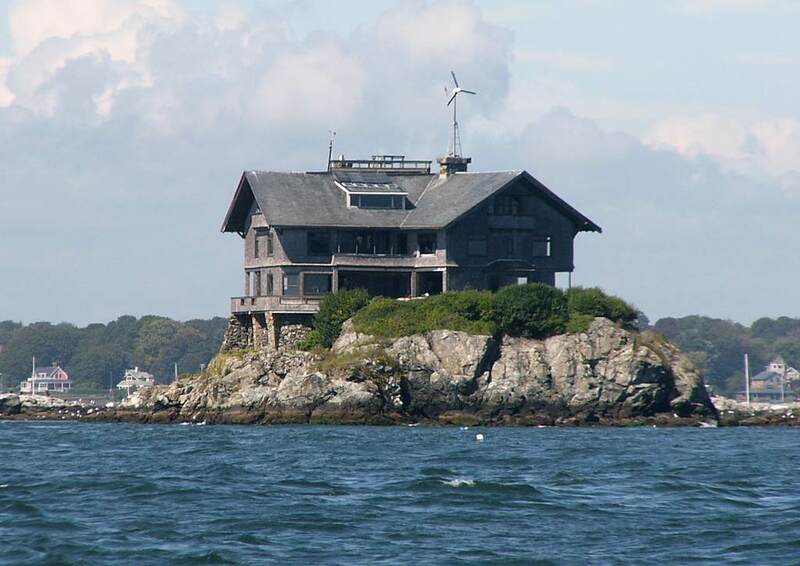 Clingstone, an unusual, 103-year-old mansion in Rhode Island’s Narragansett Bay. The house was abandoned in the 1940’s until it was bought by Henry Wood in 1961 for $3,600. 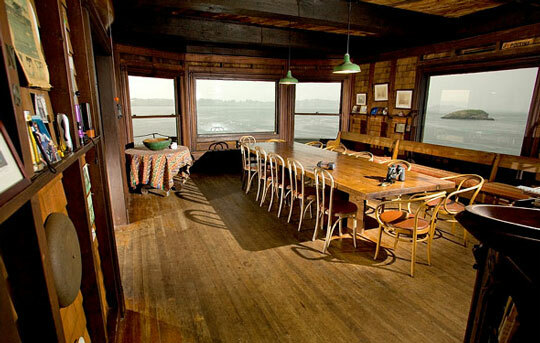 Henry Wood, the owner, runs the house like a camp: all skilled workers welcome. The Jamestown Boatyard hauls the family’s boats and floating dock and stores them each winter in return for a week’s use of the house in the summer. 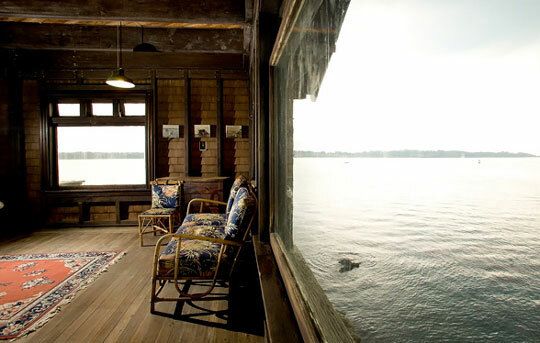 Mr. Wood, a 79-year-old Boston architect, bought the house with his ex-wife Joan in 1961. It had been empty for two decades. Clingstone had been built by a distant cousin, J.S. Lovering Wharton. Mr. Wharton worked with an artist, William Trost Richards, to create a house of picture windows with 23 rooms on three stories radiating off a vast central hall. The house is maintained by an ingenious method: the Clingstone work weekend. Held every year around Memorial Day, it brings 70 or so friends and Clingstone lovers together to tackle jobs like washing all 65 of the windows. Anne Tait, who is married to Mr. Wood’s son Dan, refinished the kitchen floor on one of her first work weekends. The total cost of the construction, which was completed in 1905, was $36,982.99. Today, the mansion which has 360-degree views of the bay offers a combination of grandiose opulence and rough beach house charm. The mansion itself is massive containing 23 room, including 10 bedrooms spread out over three floors. Credits must go to http://mystic-places.blogspot.com, who have created a fantastic blog of mystical places – something that I’ve always wanted to do. They got there before me!